Aurora, OH: Network Technologies Inc (NTI) announces the addition of the VOPEX 4K DVI/HDMI Video Splitter to its popular line of video splitters. The unit simultaneously displays the same Ultra-HD 4Kx2K image from one single link DVI/HDMI video source to two displays. The VOPEX-DVI4K-2 supports video resolutions to UHD 4Kx2K 3840x2160 for crisp and clear video quality on flat panel displays. 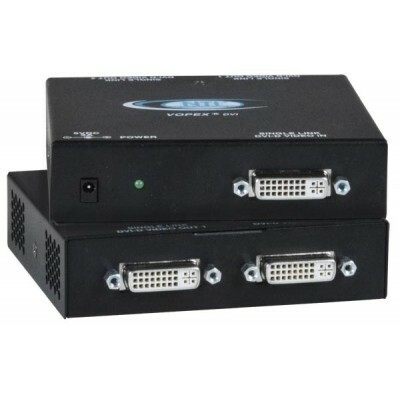 The unit passes HDMI audio and video through the DVI-I port, and a single DVI-D to HDMI cable can be used to transmit both audio and video through the splitter. Compliant with DVI 1.0, HDMI 1.4a and HDCP 1.3 standards, the unit also supports the DDC2B protocol. Multiple units can be cascaded to increase the number of displays connected for complex audio/video configurations. The VOPEX-DVI4K-2 is ideal for digital signage, tradeshows, or classrooms where high quality video on multiple monitors is needed. Available for immediate sale, the VOPEX-DVI4K-2 costs $140.